The Steelers were reeling during the 2012 season after a late November loss to the Browns in which the team turned the ball over eight times and lost 20-14. The club fell to 6-5, and without starting quarterback Ben Roethlisberger the team was set to travel to Baltimore for a matchup with the Ravens with the season falling apart. It was to be Batch’s last start with the Steelers, and it was a memorable one, leading the Steelers to a final play win over the Ravens as Shaun Suisham kicked a field goal to give the black and gold a 23-20 win. Today we go back in time, with a ‘Flashback Friday’ to relive the win at M&T Bank Stadium, breaking the Ravens 15-game home win streak. Click HERE to Read the Rest of the Game Story from That Day in Baltimore! 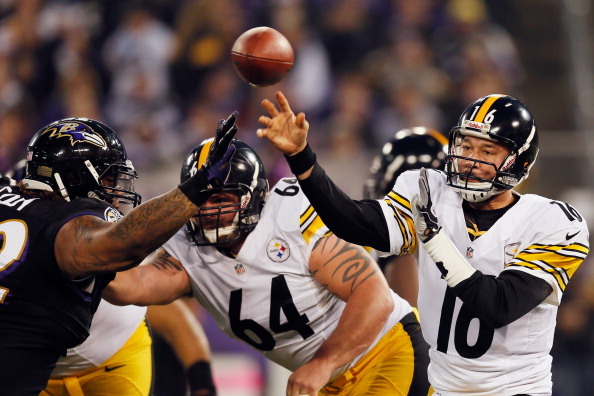 Be the first to comment on "Flashback Friday: Batch Leads the Steelers To a Huge Last Play Win in Baltimore in 2012"